Solar energy is a free, inexhaustible resource, yet harnessing it is a relatively new idea. The ability to use solar power for heat was the first discovery producing electricity from solar energy was the second discovery. There are several advantages of photovoltaic solar power that make it “one of the most promising renewable energy sources in the world.” It is non-polluting, has no moving parts that could break down, requires little maintenance and no supervision, and has a life of 20-30 years with low running costs. It is especially unique because no large-scale installation is required. Remote areas can easily produce their own supply of electricity by constructing as small or as large of a system as needed. Solar power generators are simply distributed to homes, schools, or businesses, where their assembly requires no extra development or land area and their function is safe and quiet. As communities grow, more solar energy capacity can be added, “Thereby allowing power generation to keep in step with growing needs without having to overbuild generation capacity as is often the case with conventional large scale power systems.” Compare those characteristics to those of coal, oil, gas, or nuclear power, and the choice is easy. Solar energy technologies offer a clean, renewable and domestic energy source. Solar power is possible anywhere – power generation with solar energy can be obtained on every roof, every surface or as an investment via participation with citizen funded power plants. Solar power plants are often government supported and generate money. Solar power is the modern form of power generation: It is regenerative and highly economical. It is also environmentally sound, since it does not consume any fuels and it produces no exhaust gases, CO2 emissions or any other harmful pollutants. Once the operational commissioning has been completed, hardly any maintenance will be necessary. Furthermore, the solar modules are stable and highly durable. 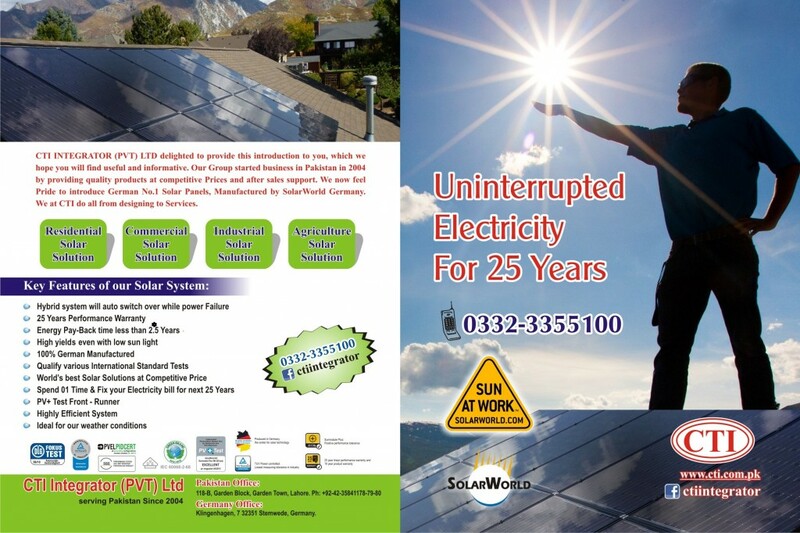 Solar power plants come with a long service guarantee. They amortize relatively quickly in comparison to their long life. Thanks to modular technology, solar power systems can be easily adapted to meet your individual power demands and can be expanded upon according to your preferences. Power is generated in decentralized form and is independent from conventional power stations. Solar power creates energy awareness – therefore, our own electric power production on the roof will have a moderating effect on our energy consumption. Solar power increases quality of life – it is a source of energy that generates clean power and does nothing to harm the environment. Solar power ensures security. It is continually available, regardless of your location and critically, it exceeds the requirement of the world population by a multiple! The sun is a peaceful energy source and is available to all. And it is doubtful that any wars will ever be fought on account of solar energy.